When I met Stacy, way back in 2002, she was a woman in denial of her own geekiness. Now, in general, Stacy is a person who will refuse to do many things based only on some point she’s trying to make. And she was trying to make the point that she was too cool to admit that she was into fantasy. That was until she discovered Harry Potter and fell in love with imaginative worlds. One of the things that we did together in our early years was read the books together. In fact, I was working at a Barnes and Noble and she would come to our midnight parties to pick up her copy as soon as she could. It’s one of those early attractions that has remained a strong bond for all these years. Last year, we were able to fulfill a long time desire of ours and visit The World of Harry Potter at Universal Studios. It’s certainly a magical place full of cool gimmicks and imagery. 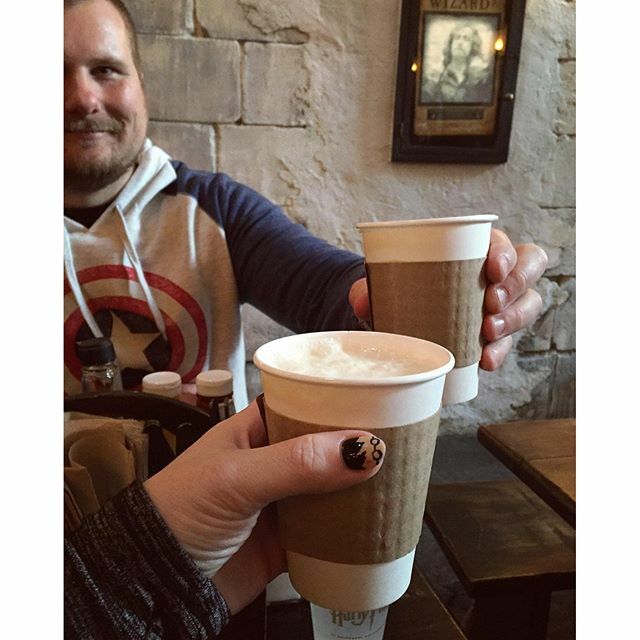 And one of the best treats about visiting Diagon Alley, in our opinion, is the butter beer. Among the other magical moments described in Harry Potter, every reader imagines and wishes drinking a bubbly, frothy cup at The Leaky Cauldron. Butterscotch is already one of our favorite flavors and turning it into a drink, especially the frozen version, did not disappoint! Since we visited, Stacy has wanted to recreate this drink. 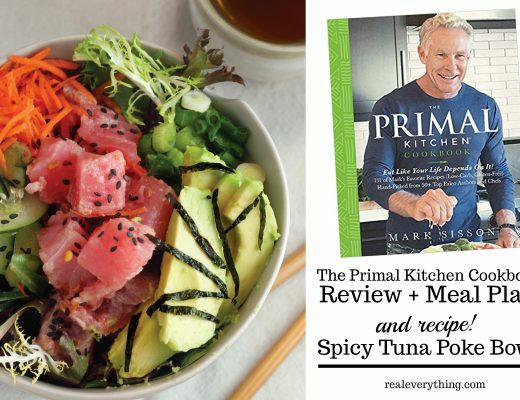 With much research and testing we finally share with you this clean-er ingredient version that’s just as magical. 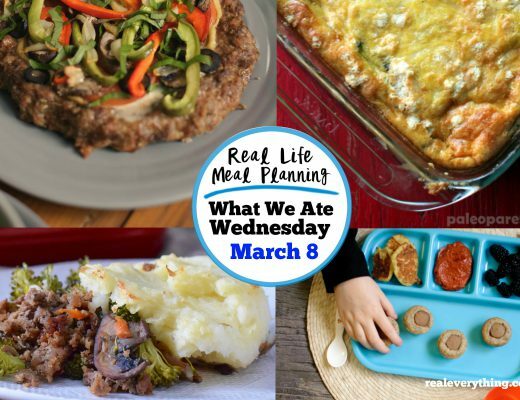 This recipe is just as good as the “real” thing. 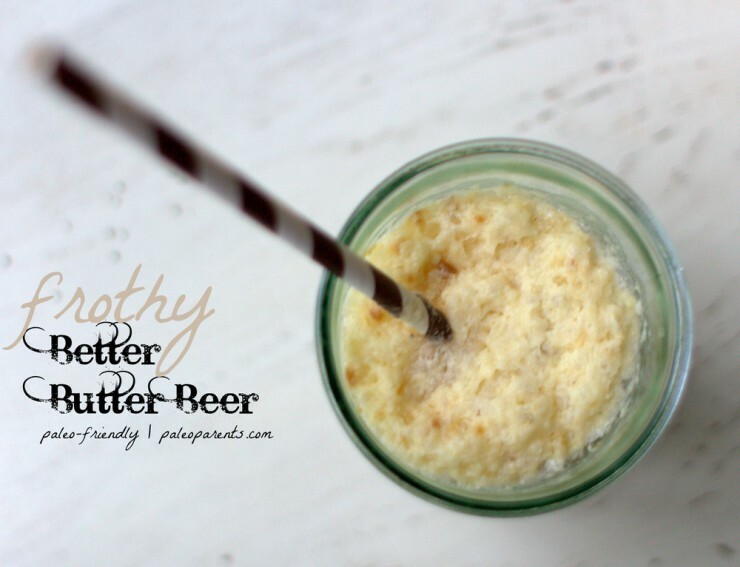 It’s cold and delicious and creamy and wonderfully butterscotchy. In a medium saucepan over medium heat, melt the butter and heat until beginning to froth. Whisk in the sugar, cream, and salt. Heat until just boiling, turn heat to low and cook for about 10 minutes, stirring occasionally. Once thickened, remove from the heat and stir in the rum extract. The sauce will thicken further as it cools. Transfer to a storage container (like a mason jar) and chill in the fridge for at least 30 minutes. Combine all ingredients on a baking sheet lined with parchment or silpat. Bake until fragrant, crisp, and golden brown, about 10 minutes. Let cool before adding to ice cream; add chopped pecans in the final minute of churning. Scoop ice cream immediately or freeze for later. If frozen for more than 4 hours, allow ice cream to sit out at room temperature for 15 minutes to soften before attempting to scoop. Scoop one or two scoops of ice cream into a glass. Pour several tablespoons of the butterscotch sauce over the top. Fill the rest of the glass with the bubbly soda/water and serve. It will froth up on it's own - but if you add ice cream or buttercotch to the top after it's frothed it will disappear. 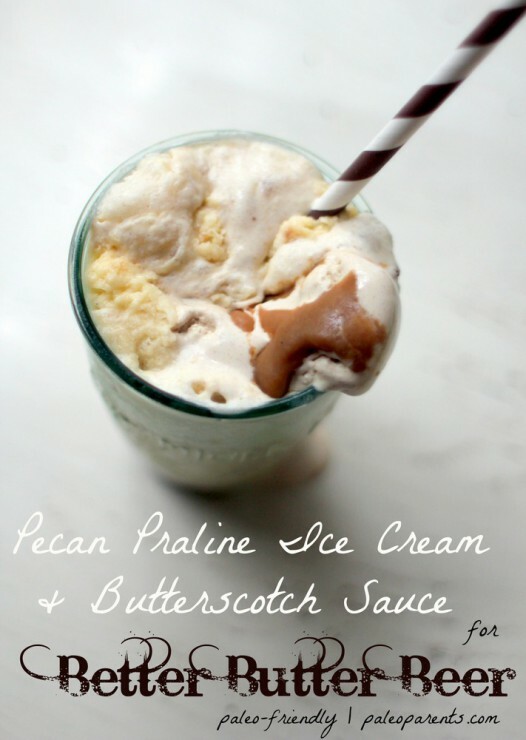 Admittedly, it’s a bit of a labor of love if you do make the butterscotch, pecan pralines, and ice cream yourself. 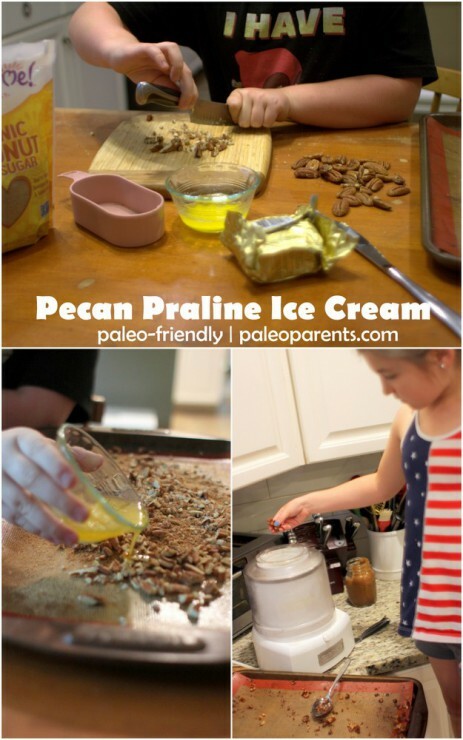 However, every single kid in our house – including Jennifer from Predominantly Paleo’s girls – were eager to chip in and contribute to this very special treat. It would make a fantastic summer project or birthday beverage! 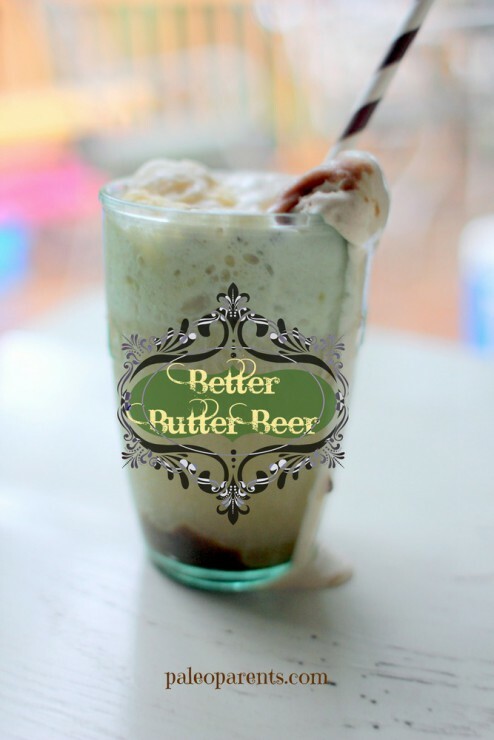 Of course, you could make a number of various short-cuts, but here’s how we recommend you make a BETTER Butter Beer! 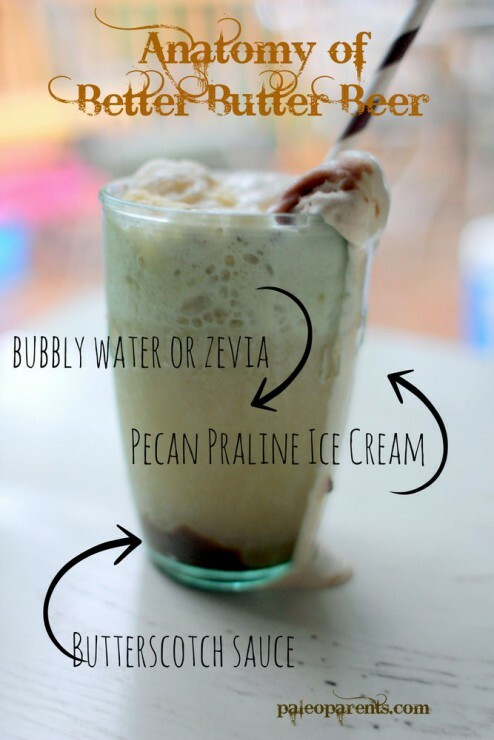 Fun Paleo Summer Eats – Smoothies, Ice Cream, and Zucchini!